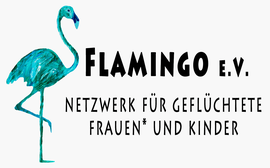 The development of the cooperation project of the Amali Foundation and Flamingo e.V. started in December 2016 and is now complete. With furniture donations and many supporters*, we were able to set up four two-room apartments near the office ready for occupancy. In the first year four babies were born and the residence status of the young mothers could be secured. In addition to living space, the women* also receive comprehensive social and resident counseling and accompaniment to authorities and doctors. Pregnancy and childbirth are a significant, often exhausting time in a woman's life. Pregnant women* are legally and socially under special protection. After all, it is important to create the best possible conditions for the start of a new life. But what if this phase of life occurs during or shortly after a flight? Refugee pregnant women face additional challenges. In general, they have already taken many risks to escape an intolerable reality of life. Not a few of them have experienced physical or sexual violence on the dangerous route. They are exhausted from the efforts they have taken, both the physical and mental health is burdened. In addition, their situation in Germany is initially characterized by many uncertainties: In order to stay, they must undergo a complicated asylum procedure. A long time is determined by waiting and the fear of getting deported. In the initial reception centers, where people live after their arrival in Germany, there is no privacy and hardly any protection against reoccupations. Under these circumstances, to prepare for a birth or to give the already existing children the necessary attention is hard to cope with. Our project "Safe Nest" offers women a protected own living space for a limited time. Here they can regain strength, prepare for childbirth and spend the first time with their newborn. The aim is to stabilize women, secure their stay and build long-term perspectives. If necessary, they receive comprehensive advice and support.